In most cases, you will want to supplement your marijuana grow with nutrients. This ensures that your plant gets everything it needs to produce lots of potent buds. However, it’s important to remember…. More Nutrients DOES NOT EQUAL More Buds! I know, I know, you want to do everything you can for your plant. But the truth is, often marijuana needs nutrients at half strength or LESS of what’s recommended on a regular nutrient schedule for plants like tomatoes. Basically, as long as your plant does not have any nutrient deficiencies, adding more nutrients is not going to cause the plants to produce more buds. If you’re growing in soil, you will want to get nutrients made for soil. If you start with really good soil, you may be okay for most of the vegetative stage, but you will likely need to supplement nutrients during the flowering stage to get the best results. If you are growing in any medium besides soil, like coco coir, water or a soilless mix, you will need to get hydroponic nutrients (nutrients specially formulated for hydroponic growing). Some growers mix their own nutrients, and that can definitely save a bit of money, especially if you’re growing a lot of plants. For most new, small-scale, or hobbyist growers, it’s often easiest to buy a nutrient system that has already been formulated for you by professionals to be successful when growing plants like marijuana. Basically, you need a set of nutrients that are designed for a flowering/fruiting plant like the tomato. There should be a different nutrient schedule for the “vegetative” and “flowering/budding” stages. Almost any set of nutrients like this will work for growing marijuana. What’s an Easy Marijuana Nutrient System that still grows ultra-potent buds? Dyna-Gro, like most nutrient systems for marijuana, can be used at half-strength to start. However, unlike many nutrients, Dyna-Gro can be used in any growing medium. That means you can use Dyna-Gro as your nutrients to grow marijuana in soil, water, coco coir, or any growing medium. In addition to working in any growing medium, Dyna-Gro produces healthy plants, and ultra-potent buds when growing marijuana. Just use the Dyna-Gro “Foliage Pro” formula at half strength during the Vegetative stage and switch to the “Bloom” formula once the first white pistils/hairs appear in the Flowering stage. Dyna-Gro is super simple to use, and your plants will love it. With all nutrient systems, don’t start at full strength or it will burn your plants! In fact, most nutrient systems should be used at half-strength or LESS! Another great marijuana nutrient choice for hydroponic marijuana growers is… the General Hydroponics Nutrient trio. Download custom marijuana nutrient schedule for the General Hydroponics Flora series, for growing marijuana in coco coir or bubbleponics. Generally, if a set of nutrients is formulated to work for a tomato plant, they’ll work for growing marijuana. 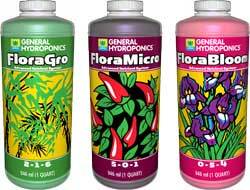 General Hydroponics Flora Series, I also recommend Fox Farm Hydroponic Nutrient Trio with your hydroponic grow, or Fox Farm Soil Nutrient Trio for your soil grow. These nutrients contain everything your marijuana plant needs, and each trio comes with a nutrient feeding chart that explain exactly how much nutrients to add. Keep in mind that you should treat the nutrient feeding chart that comes with your nutrients as the maximum, and should always start with a fraction (I usually start with half) of the recommended nutrients and work your way up only if you see signs of nutrient deficiencies. Some marijuana strains are more likely to love high amounts of nutrients, while others are actually suprisingly sensitive and will do best with half the amount of nutrients as other strains. Because of this natural variation between plants, there’s no one universal nutrient schedule that works for all strains. Even between plants of the same strain, there’s a lot of variation. That’s why each nutrient schedule you ever see more of a starting place than a hard and fast guide. For the best results, you may have to adjust the percentages (add more or less water) depending on what your plants are telling you. Just having the nutrients there isn’t enough by itself. You also need to make sure the pH of the root environment is correct so that your marijuana can properly absorb the nutrients. The easiest way to maintain a proper pH is to test the pH of your water, after adding nutrient, before you water your plants. Now some lucky people are still successful at growing marijuana even if they never test the pH of their water, but most growers who don’t test for pH will grow plants that suffer from what appear to be nutrient deficiencies and other nutrient problems. Even if the nutrients are present, your plants can’t absorb them if the pH is not right. Testing and adjusting the pH is actually really easy, quick, and cheap. There are special pH kits that are made just to help you do this. Learn how to check and adjust the pH of your water. It takes < 5 minutes to do this, and it is one of the best things you can do when watering your plants to get monster yields with huge buds and healthy plants. A general rule of thumb is to keep around a pH that ranges from 6.0-7.0 for soil (with the pH kept mostly between 6.5 – 7.0), and a pH that ranges between 5.5 – 6.5 for hydroponics. A little bit of range is actually healthy since different nutrients are absorbed better at different pH levels. Buy a cheap yet effective pH Control Kit from General Hydroponics.